"We've got to trust someone-why not let it be the bee?" For me, it was a miracle drink. This write-up is long overdue. I had wanted to get it out but unfortunately other things had taken priority. I personally vouch for it as it had helped me so much in recovering from a bout of severe bronchitis sometime back last year. It is such a simple and effective remedy. I think it's worth giving it a try if you have to continue to seek more and more over-the counter medications to treat symptoms of an inflammation of the mucous membranes of the bronchial tubes, such as a persistent cough, phlegm, chest congestion, throat infection, and blocked sinuses. 1. Mix 3-4 tablespoons of raw, unfiltered, organic apple cider vinegar with the "Mother" and a tablespoon of honey in a mug of hot water. Note: Raw unfiltered cider vinegar contains enzymes and minerals that over-heated and over-processed vinegars do not have. 2. Sip it while it's hot. This would help dissolve and break up the mucous and ease the cough. 3. Drink the concoction 2 times a day. Taking it before bedtime helps in getting a restful night. This wonderful drink is a natural probiotic. The acetic acid in apple cider vinegar naturally kills the germs that are causing the infection and balance the pH levels in the body to reduce inflammation. Potassium in cider vinegar helps to thin the mucus. Honey acts as a natural demulcent to soothe the cough and its antiviral, antibacterial and anti-inflammatory properties reduce the swelling of the bronchial tubes. The synergistic effect of the combination makes it an effective expectorant for loosening the mucus in the respiratory tract and expelling the phlegm. 1. Be informed, apple juice and apple cider are not the same. Read: Is Apple Cider the Same as Apple Juice? 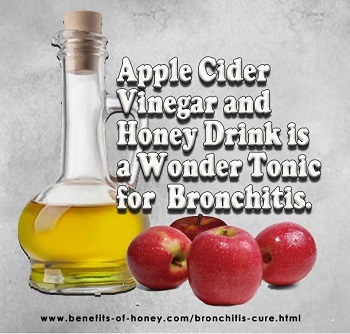 End of #1 Natural Bronchitis Cure - Honey and Cider Vinegar. Back to "Apple Cider Vinegar and Honey Remedy"